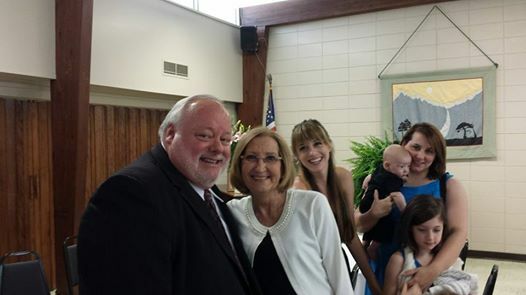 Many of you know Jeanie as Pastor Rick’s wife and mother of Shelbie Shave, Josh, Sage and Caroline Shearouse. She is “Grams” to Destiny, Emery and Steele Shave. Some of you know her as a teacher at Cypress Springs Elementary School. Others of you know Jeanie because you grew up with her and the Freeman family in Dumas, Arkansas. Jeanie is a strong woman of faith, an amazing wife, mother, grandmother and friend. And now she needs our help and prayers. Seven years ago, she was diagnosed with non-alcoholic cirrhosis of the liver. Jeanie was treated with medications and diet for several years. Recently her liver began to weaken, causing her body to retain fluid, which prompted her doctor to suggest a procedure that could alleviate the fluid retention. Sadly, the procedure was attempted but could not be completed. While in the hospital, her condition worsened rapidly and Jeanie was placed on the liver transplant waiting list. She was sedated for over three weeks before receiving the miracle of a new liver on April 12, 2014. Jeanie and Rick now face a challenge they cannot meet alone. This brings us to the purpose of this letter. The transplant was not only a major surgical procedure, but it was very expensive and insurance will not cover all the costs. As friends and family of Jeanie and Rick, we can offer our help and prayers during this time. We can also help financially. A fundraising campaign in Jeanie’s honor has been established with HelpHOPELive, a nonprofit organization that has been assisting the transplant community for 30 years. All donations are tax-deductible, are held by HelpHOPELive in the Southeast Liver Transplant Fund, and are administered for transplant-related expenses only. For those who are able and would like to contribute, please select the “Donate Now” button or see the “Mailing a Check?” box on this page. To all of you who have already been standing with us in prayer, have showered us with food and gifts, and helped us in many more ways, the Shearouse family cannot thank you enough. We can say God has shown us Love through each of you and that we pray Blessings for you also. Just wanted you all to know how well Jeanie is doing! We celebrated Thanksgiving and Christmas as a family great tidings of comfort and joy! Thank you again for all your love and support, Jeanie is entering her 39th week since her transplant and doing great! Praying that all of our family and friends have a healthy, prosperous 2015! May the Lord bless you most abundantly in the new year! Thank you for giving from your heart to Jeanie! Happy Thanksgiving from our extremely thankful family to yours! 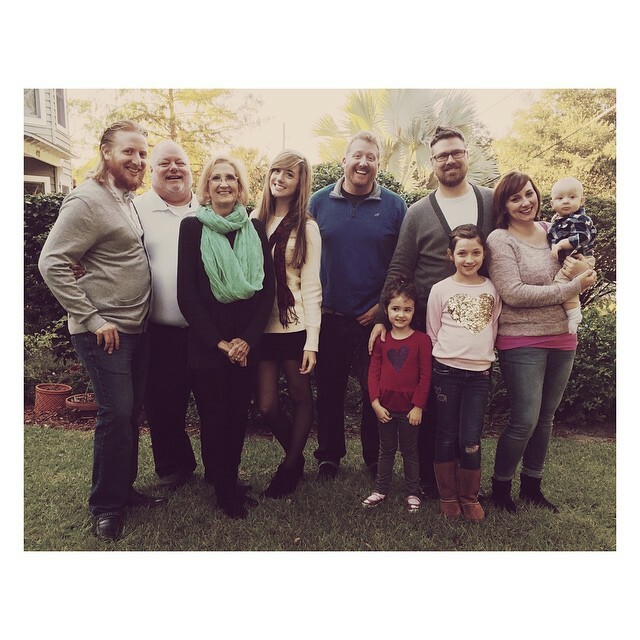 See the new picture of our family taken on Thanksgiving day November 27, 2014! We are very thankful for everyone who has prayed for Jeanie and the Shearouse family these past eight months! Your prayers and love are received with much appreciation! God heard your prayers and healed Jeanie in most miraculous ways! (Rick and Jeanie just celebrated their 35th wedding anniversary!) As the Shearouse families sit down to their Thanksgiving meals tomorrow, we give thanks to God for each of you and pray that He blesses your family with His abundance! Thankful for the relentless care given to Jeanie by her husband Rick and family! 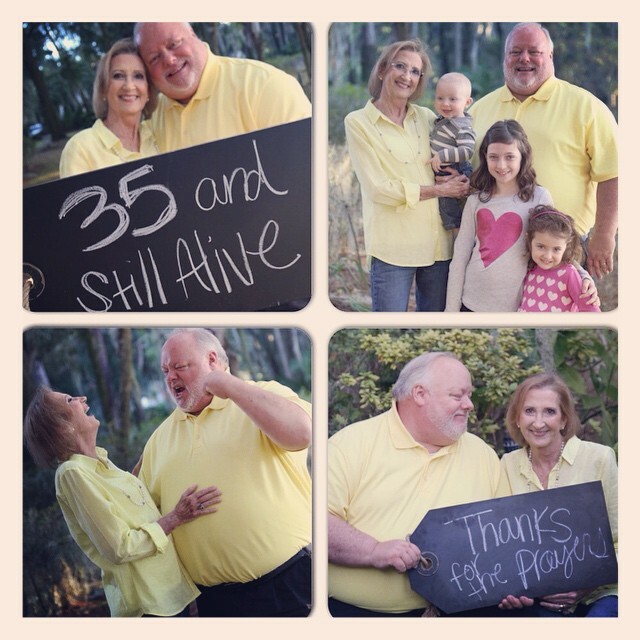 Read Rick’s story on the HelpHOPELive blog this month! Caroline’s post September 22, 2014: “Oh what a day! Thankful does not describe how I feel knowing my mom finished her first day back to work since her liver transplant five months ago! She came home smiling, and that was all I needed to know it was a success. Everyone who prayed, or is still praying you are incredible, and you truly express the meaning of friendship, and faithfulness. Love all of you! God is so good:)” Thank you God!!!! Josh posted September 22, 2014: “I feel so blessed today!!! My mom is going back to teach her new second graders today. She is fully recovered from her liver transplant, and is alive and well thanks to the miracle God gave us. I can’t thank you enough everyone who threw out a prayer or even a thought to her and my family. My God is an Awesome God! !” God is still in the “restoration” business! Shelbie’s post Sunday September 21, 2014: “On Saturday, April 12, 2014 at 4:00 a.m., my siblings and I, along with our dad, made a circle around my mom’s hospital bed. Gathered in that tiny ICU room, we each prayed our own prayer over her and trusted God’s will. My youngest brother, Sage, began to sing the worship song “Breathe” and we ended our intercession a few seconds before the OR called. We sang that song this morning and it all came back to me in my mind’s eye. I am a first-hand witness to the sovereignty of God and the power of prayer. For all of you prayer warriors, family, friends, friends of friends, and people who barely even know us, I wanted you to know that Mom will be going back to work tomorrow! She will be teaching the less stressful 2nd grade, thankfully. We are reminded daily that God still performs miracles and know that He who started the work is faithful to complete it. Never forget how treasured all of you are to us! ~Phil. 1:3-11~” WOW!!!! Our news from Orlando continues to be GOOD news! 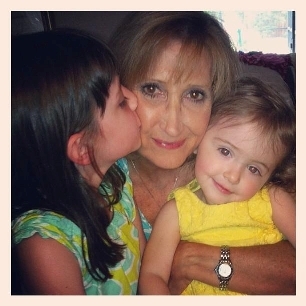 Jeanie is happily spending time with her grandchildren as she continues to strengthen her body. She is very eager to return to the classroom and hopes to do so soon. The entire Shearouse family praises God for his mighty healing power! We also give thanks for friends fervently praying for Jeanie and her family. God is still answering prayers today! Blessings to you all. Jeanie and her family are back from Arkansas and doing well, all things considered. Jeanie continues her weekly clinics and receives good reports from her doctors. She is now able to walk up stairs and use an exercise bike! What progress from 4 weeks ago when she was just starting to use the walker to navigate in the house! Praise God for his healing power! Thank you for your continued prayers and encouragement. Your gifts are such blessings to the Shearouse family! Your support has been overwhelming and we can never thank you enough for standing with us through this storm! May God continue to bless each of you! For those of you who may not have heard, Jeanie’s mother Phyllis Freeman of Dumas, AR passed into heaven July 10. Jeanie’s doctor approved for Jeanie to travel back home to be with her father, brothers and family for her mother’s funeral. Although a hard trip of two days, Jeanie has been able to see her father and brothers for the first time since her transplant. Praise God, Jehovah-Rophe, our Healer! Please continue to pray for Jeanie’s strength and healing as they travel back home. Today, Independence Day, Jeanie is able to celebrate life, liberty and happiness with her family because someone was an organ donor! She is getting stronger and able to be more independent with her daily activities. The doctors are very pleased with her progress! She has been so blessed by the prayers and words of encouragement from each of you! The Shearouse family has experienced both sides of organ donations and encourages each of you to consider designating your desire to be an organ donor today. We never know what tomorrow might bring! God Bless You! Jeanie has made amazing progress since she came home June 13, 2014! She is getting stronger every day and walking with the aid of a walker, which should be replaced soon. The best therapy she has comes from the love of her husband, children, grandchildren, family and friends. Nine weeks after her transplant, her medical statistics remain positive. She is very grateful for your prayers and encouraging notes during these last few months! She realizes God was, is and will be forever in control of her life! We give God all the glory, praise and honor for being where we are today! “And let the dance party begin! Doctors just came in to tell my mom her discharge date is Friday the 13th…so all you people keep your superstitions to yourselves because Gods timing has been so perfect so far! Totes ready to roll out of here! (and que the Justin Timberlake music. )” Praise God, Praise God!!! From Rick today: Good day for Jeanie. She walked with a walker across her room and out into the hall. Hoping to go back to rehab Friday. She has been in the hospital eleven weeks today. Thanks for standing with us! Jeanie walked about 8 feet on the parallel bars today with assistance! And…she did it three times!!! She’s come along way since she moved to the rehab unit, but you “ain’t seen nothin yet”! This amazing woman was told she could go home June 12th if she continued at her rate of progress. Destination: Home! She is programed to get there the fastest route and she is not going to take any detours! We thank all of you who have lined her route with layers of prayers and encouragement! Another milestone has been reached!Jeanie made the move to rehab last evening! She was welcomed by a new set of awesome nurses! Now her daily workouts begin! She gains more strength every day and we expect God to continue his healing miracles! We cannot praise him enough! Shelbie’s post: “As of today, Mom is being moved from the luxurious 12th floor of The Tower to the not-so-luxurious rehab part of the hospital. She will endure 3 hours of intense therapy 5 days a week until she is ready to come home. She’s nervous, but ready to get it done! I just realized it’s the 21st (baby fog brain) and this means we have been walking this journey for exactly 2 months and 1 day. Whew! We’re getting there! “This is the day the Lord has made! We will rejoice and be glad in it!” We are rejoicing with Jeanie with the removal of her feeding tube this morning! This is the last of the tubes! She is on her own now, so pray for desire of food to return and restoration of the taste buds and sense of smell to return to normal. Praising God for all the wondrous works for Jeanie today! Just posted by Shelbie: “Mom’s liver biopsy report came back looking great! All issues are due to medication and NOT the condition of the liver. She will have a swallow test today to see if she is finally able to handle solid foods and liquids (it’s all been thick liquids and puréed food so far). If she is, then the feeding tube can be removed! Thankful for a super-hero Mom and a big God who always saves the day.” It is so good to see Jeanie smiling and speaking to us! “My grace is sufficient for you, for my power is made perfect in weakness.” 2 Cor 12:9 We have seen God’s powerful, perfect healing hand on Jeanie during her weakness! Jeanie is sitting up and smiling as her family celebrates Mother’s Day with her. Check out the picture in her photo album section below! We are praising God today for more answered prayers! The report from Rick yesterday afternoon: “Today has been much better emotionally. Jeanie slept last night and it made a huge difference in her. No anxiety today. She has worked real hard at all her therapy and even stood up three times with minimal assistance. Been napping this afternoon. Trying to eat a little more too.” We are grateful for your prayers and your financial support. James 5:16 “…The effectual fervent prayer of a righteous man availeth much.” Indeed, God has blessed us with much love from all of you and much healing for Jeanie! Please pray fervently for Jeanie and her family! From Shelbie’s Facebook post: [Steele’s levels have peeked and are finally going down. So glad there is no blood work to be done tomorrow! Across town, Mom sat up for over 15 minutes today and received a regular hospital bed. She is still struggling with mental and emotional issues, so please pray for her peace of mind and everyone else’s ~”You heal the broken-hearted, You sustain the humble, You have perfect understanding…so I fix my eyes on you, Lord.”~] Thank you all for your prayers and support! Praising God for His healing hands on Jeanie! Rick’s text yesterday afternoon: “Big day of progress, heart monitor removed, catheter removed, off pureed food, all meds by mouth. Still struggling with anxiety and itching, but grateful.” Jeanie was able to stand up for a few seconds during her physical therapy! Please pray for the anxiety, fear, panic, confusion and sadness that she is experiencing. Also, pray for Rick to have the wisdom and strength to handle his role of devoted husband and loving father. And, the Shave family needs prayer as Shelbie devotes her time for caring for their new son Steele! Our God is awesome and has shown us his grace and glory through all of this! We are grateful for each one of you for standing with us and holding up our arms during this battle. We love you! Other great news in Jeanie’s life is the birth of her first grandson, Steele Silas Shave. Shelbie and son went home from the hospital yesterday on his daddy Jason’s birthday! His big sisters Destiny and Emory were delighted with his arrival. Just this morning Shelbie and the girls were able to have an actual conversation with Jeanie over the phone! Please keep your prayers lifted up for Jeanie and the Shearouse family. God hears the prayers of his people! Seven years ago Jeanie was diagnosed with non-alcoholic cirrhosis of the liver. With medications and adjustments to her diet she maintained her dedication to teaching at Cypress Springs Elementary School, rarely missing work. Recently her body started retaining fluid, causing discomfort in her feet and abdomen. When a doctor suggested a procedure to place stents in the liver to help drain the fluid, Jeanie saw a glimmer of hope for the first time in years! She entered the hospital on March 19, 2014 expecting to be out in a couple of days. Unfortunately, the surgeon found a deteriorating liver with no healthy veins to support the stents and aborted the procedure. That day began the roller coaster ride for the Shearouse family! Their strong faith in God, their prayers and the supporting prayers of friends brought them through the next three weeks of waiting for the liver transplant! As always, God’s timing is perfect! He provided the donor liver and the liver transplant was performed on April 12. The last few weeks have had their challenges, but God’s ministering angels have delivered Jeanie and her family to the road of recovery! Jeanie has passed the swallowing test to be able to accept thick liquids and pureed food! She has taken her first bite of food in 43 days! Although she is still in ICU, her doctors are considering her transition to the transplant recovery area very soon! Her doctors and nurses are amazed at the progress she has made since her liver transplant on April 12, 2014! We continue to give our AWESOME GOD all the glory. And we gratefully thank each of you for standing with us in prayer and blessing us with your gifts of love, time, food, financial support, and all the many other ways you have been there for us! We love you all! Keeping you close to my heart and praying that you will regain your strength and recover quickly. Your absence is greatly miss at Cypress Springs. Keep up your fighting spirit and keep up the faith. May God keep you in his care! We are both walking miracles, cannot wait to hit the motivational tour with you.. pastor Rick will have to take a back seat .. I love you dearly .. As I am enduring radiation and Chemo , I am for -ever grateful for all that God has done in both of our lives. we both need to be here for our Children and our Grandbabies..
Romans 15:13 - "Now may the God of hope fill you with all joy and peace in believing, so that you will abound in hope by the power of the Holy Spirit." So thankful that through the Holy Spirit, we can OVERFLOW with hope! Looking forward to seeing y'all next month! Jeannie, may you find peace and comfort during this recovery. We are so grateful for the successful transplant. You are in our thoughts and prayers. May your smiles get broader and last longer every day! There are lots of people praying for you here in West Kentucky. You're going to have an AWESOME testimony to share. Love y'all! We are praising God for His continuous miracles in your life! Standing with you in prayer!